There are five bedrooms which all have King Size beds and ensuite bathrooms with beautiful outdoor showers and gardens. They also all have air-conditioning, ceiling fans, hairdryers, safes, European bedding, satellite TV’s, flat screen TVs, and DVD players. 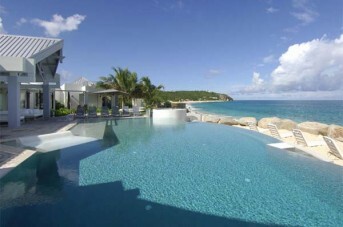 La Reve Private villa is located on the island of St Martin in the Caribbean. All major airlines fly into Princess Juliana airport. Luxury private villa La Reve (“the Dream”) is the perfect luxury holiday destination and offers peace, privacy and seclusion on the island of St Martin in the Caribbean. La Reve is a 5 bedroom villa on a private beach in Baie Rouge. The villa boasts ultra modern décor with state of the art equipment throughout the villa. There is a large heated pool and Spa Pool and two screened in beachside gazebos for massages or relaxing in the shade! There is also a private tennis court which is lighted. The fully equipped gym has fitness machines, free weights and bench, boxing bag, fit balls, and yoga mats. There is also a large billiard and entertainment room which are extremely comfortable and spacious. The living and dining areas are spacious and very suited to entertaining large groups of people. There is seating for 14 people in the dining room on a special designed Tucker Robbins Wood sculptured table. The kitchen is an Effitti Chef kitchen – a pleasure to cook in! There are five bedrooms and they all have ensuite bathrooms. The villa has a secure alarm system, electronic security gate, fitness equipment, high spend internet, Spa Pool, heated infinity pool, satellite TV, and a private lighted tennis court. Maid service is daily, and there is the option of hiring a chef at an extra charge.